In charge of staff and operations for a small, urban community branch in a larger system. Includes the direction of outreach efforts, professional development of staff, in-house programming planning, mentorship, and ensuring quality of public servises. 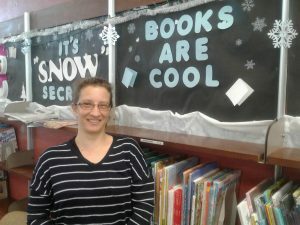 What are some things you like about your job or working in libraries in general? The community of Allapattah needs the library. I feel like the service the library, and its staff, provide helps to make the community livable. The interactions with customers through transactional activities and programmatic events have a positive impact on the area. What got you interested in libraries? In college, I adopted one of my professors and his wife as surrogate grandparents as they were in their 70’s. They used to join my family on thanksgiving and Easter holidays. The professors wife was an academic librarian, and I very much admired her work as she described interaction in her field. She had been a subject area librarian with a second degree in biology, and this was impressive to me intellectually. Both she and the professor served as mentors to me in my studies and worklife, guiding me towards my first library job at a university as a circulation supervisor. He passed away before I began library school, and she passed away 6 months after my graduation and accepting my first professional job. What is one of your favorite things about NMRT? My favorite aspects are the mentorship and social roles, especially interacting with other new librarians. I love to hear how and what others are doing to get ideas and feedback of what folks are engaged with, especially upcoming professionals. Do you have any advice for other new librarians? The new librarianship is really about making connections between our community, our customers, the library as a space, and the library as a collection of resources and materials. Outreach and programming are just two ways of making these connections to solidify the library’s place in society.